Prepare to be outraged, because the Central Intelligence Agency just committed an error that has put the entire nation at risk. 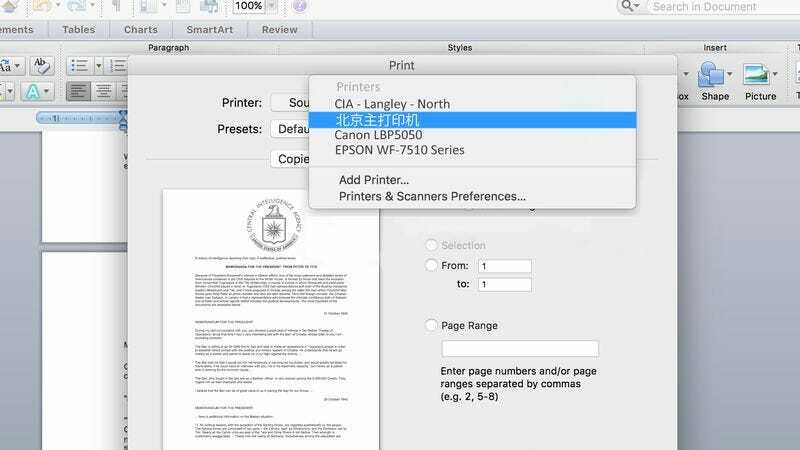 Yesterday afternoon, the CIA inadvertently disclosed sensitive intelligence memos to the Chinese government after accidentally selecting a printer in Beijing from the drop-down menu in the print dialog box. Unbelievable. This is a major foreign policy disaster. According to sources within the agency, a CIA employee trying to print out the memos for an internal intelligence briefing mistakenly selected a printer inside the Chinese Ministry of State Security instead of the CIA’s own printer, causing China’s printer to start producing copies of hundreds of documents detailing confidential American policy on everything from ISIS and digital surveillance to the hot-button issue of Taiwan. When the documents failed to print, the CIA initially believed its own printer was misbehaving and attempted the print job several more times before realizing the mistake. By that point, however, it was too late, as a thick stack of papers discussing our nation’s most closely guarded secrets were already sitting in the printer tray in Beijing. Yikes. The CIA definitely wishes it could have this one back. Besides giving China direct access to top-secret information, U.S.-Chinese relations were further strained after top Chinese officials who were trying to print a document of their own grew furious as they had to sit through the lengthy American print job. Meanwhile, the economic fallout from this incident has already begun as China invoiced the Obama administration for five cents per page to cover the cost of ink and paper. While there’s no telling just how badly this leak will hurt us in the long run, this is an inexcusable error at a critical international moment that could have been avoided by spending just a few more seconds reviewing the print settings. Heads better be rolling after this one.